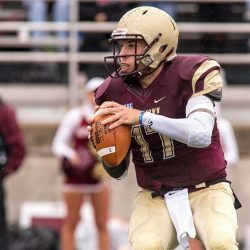 KUTZTOWN, Pa. – Collin DiGalbo accounted for six touchdowns and led the Kutztown University offense to 547 yards on Sept. 16 to earn this week’s Pennsylvania State Athletic Conference (PSAC) Eastern Division Offensive Athlete of the Week. The Golden Bears (2-1) rolled to a 62-17 victory on Saturday afternoon over Seton Hill. DiGalbo completed 17-of-21 passes for a career-high 301 yards and five touchdowns. He also ran for a 1-yard touchdown to cap his six-touchdown afternoon. He is the first Golden Bear to throw for 300 yards since Chad Barton in 2015 and is 1-of-7 players in school history to throw for five touchdown passes in a game. The redshirt-sophomore is averaging 229 passing yards per game and has thrown eight touchdowns with one interception this year. He leads the PSAC and ranks ninth in Division II in completion percentage at 70.1 percent. For his career, DiGalbo holds an 8-2 record as a starting quarterback. The Golden Bears open division play at home on Saturday, Sept. 23, against Millersville University under the lights at Andre Reed Stadium beginning at 6:05 p.m.